At first glance, it looks like a UFO or a spaceship from a sci-fi movie but is actually a very special asteroid. It was first observed in October this year by the Pan-STARRS 1 telescope in Hawai'i. At the time of its discovery, the asteroid, since named 'Oumuamua, had just swung around the sun and was leaving our Solar System. According to a European Southern Observatory (ESO) press release, 'Oumuamua is "like nothing seen before." It is red, made of dense rock or metal, and is shaped roughly like a giant cigar at least 400 meters long. These are the findings of a team of astronomers led by Karen Meech (Institute for Astronomy, Hawai`i, USA) who combined images from the ESO's Very Large Telescope in Chile with other large telescopes. 'Oumuamua varies dramatically in brightness by a factor of ten as it spins on its axis every 7.3 hours. "This unusually large variation in brightness means that the object is highly elongated: about ten times as long as it is wide, with a complex, convoluted shape," says Meech. The orbit calculations revealed beyond any doubt that this body did not originate from inside the Solar System, like all other asteroids or comets ever observed, but instead had come from interstellar space. Although originally classified as a comet, observations from ESO and elsewhere revealed no signs of cometary activity after it passed closest to the Sun in September 2017. 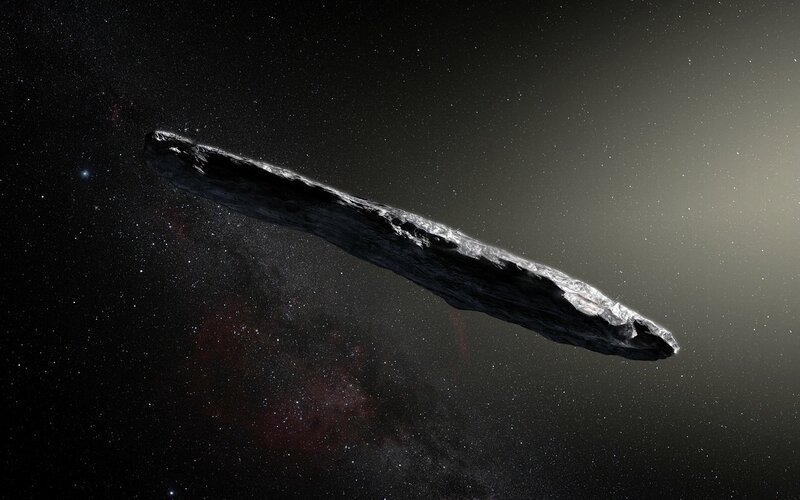 The object was reclassified as an interstellar asteroid and named 1I/2017 U1 (`Oumuamua).